I have no excuses now for not getting on with my quilting. I have taken over a corner of one of the guest bedrooms. 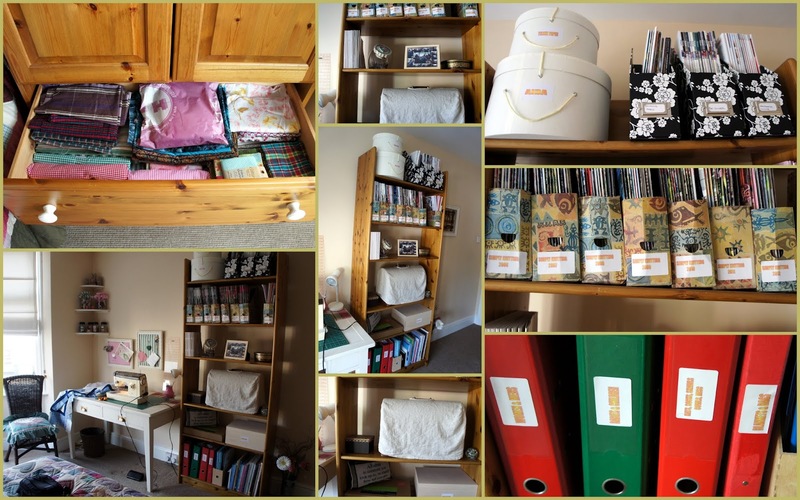 Not that any guests will have anywhere to put anything away, as I've taken over the wardrobe and the chest of drawers. What do you think? 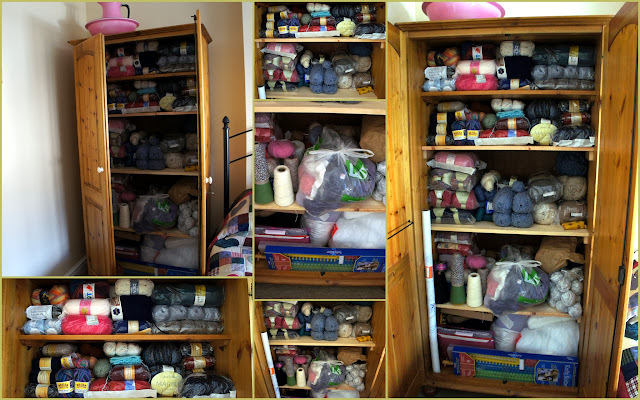 Peter shelved out the wardrobe for my yarn and associated oddments in the bottom. Its so great to see my yarn at a glance and to not have it falling out every time I opened the chest. The chest is now home - in the top cupboard to all my wrapping paper, ribbons and bows etc. Then the next two drawers are fabrics and wadding. The bookcase is home to all my knitting magazines, pattern and reference books. The folders hold all the free patterns that I have obtained from Ravelry and the web. I also have Peters' granny's old Singer hand sewing machine which still works beautifully and I enjoy using it. The table was re-topped and painted as in a previous post. The button jars (old coffee jars), the cotton thread jars (old pickle jars). I took some old picture frames which I painted then made into pin boards, just using some wadding and fabric, easy. I think they look good and cost practically nothing. In fact, the only things bought was the wood for the table top, shelves for the wardrobe and the corner shelves. I did all the painting and pretty stuff and Peter did all the woodworking and drilling. What a team! And finally the bath mat which I knitted for Rachel's bathroom. Think I should have gone round a bit more before doing the graduated cast off. Still by the time I had spent three hours sewing on the toweling back I was past caring. What a wonderful, light-filled craft room! Love the idea of putting spools of thread into decorative jars. How lovely. I took over a corner of the (dry and light filled) basement and couldn't be happier. Unfortunately for my family, I still prefer to sew in the living room. beautiful craft room! it looks like the perfect place to create. 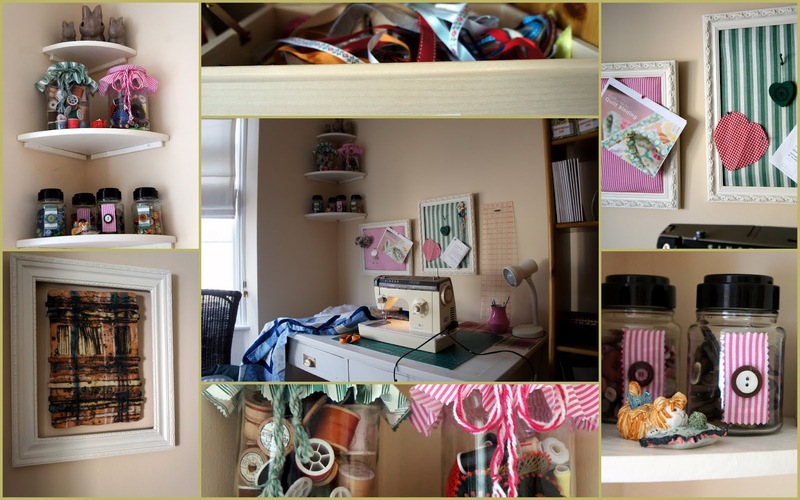 Ah, such a lovely craft room! I love it so much, such a lucky crafter you are! I also cannot believe you managed to photograph that beautiful dragonfly, he is so amazing! That looks like a lovely craft room. I hope to have one of my own one day. Your craft room looks great, so organized! You have a lot of yarn! Wow the craft room looks amazing. I am very jealous. What a wonderful craft room. It's amazing. Rachel's bath mat is lovely. She should be well pleased with it. The colours go well together. And your visitor - a beauty to behold, as are the fuchsia flowers. Oh to be this organized...my favorite part the darling corner shelves. And your hubby- what a gem to help out with this...and he's aware of your stash of yarn? You guys did a great job! I really like the pin boards you made, and the jars of notions are adorable. How wonderful to see everything at a glance. I hope it inspires many beautiful projects! The dragonfly is Awesome!! What a beautifully organised craft room, well done! 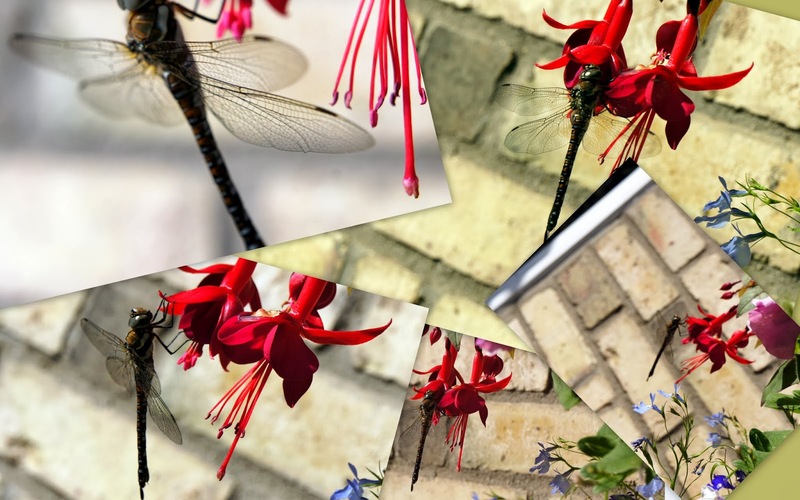 The photos of the dragonfly are amazing, too.